The Chenier Plain shoreline was created with sediment transported by the Mississippi River’s periodic westward oscillation. The swales that characterize the Chenier Plain were created by the deposition of these alluvial sediments, and these same sediments also served to extend the shoreline gulfward and create the area’s expansive mudflats. Chronic erosion in this area is caused by a lack of sand and sediment caused by the channelization and regulation of the Mississippi and Atchafalaya rivers to the east. In addition, the Calcasieu and Mermentau rivers are not supplying coarse-grained sediment to the area, and the Cameron Jetties associated with the Calcasieu Ship Channel deflect the little material that does exist away from the project area. The project’s goals are: (1) to protect approximately 8,000 acres of existing, low energy intermediate and brackish marsh wetlands north of the forested ridge and (2) to create and protect roughly 300 acres of beach dune and coastal chenier habitat from erosion and degradation. The project also provides protection for the wooded chenier to the west, which has been purchased by the Baton Rouge Audubon Society. It is being maintained as a sanctuary because of its importance as habitat for Neotropical migratory birds. The project plan consists of placing approximately 1.7 million cubic yards of high quality sand on the beach to reestablish a more historical shoreline, as well as improve the effectiveness of the existing segmented breakwater system. The project is located west of Calcasieu Pass along the Gulf of Mexico shoreline, extending between Holly Beach and Constance Beach in Cameron Parish, Louisiana. This project was selected for Phase 2 (construction) funding at the August 2001 Louisiana Coastal Wetlands Conservation and Restoration Task Force meeting. Since that time, 1.75 million cubic yards of sand were added to the beach. Sand placement was completed in March 2003. Project staff installed 102,000 linear feet of vegetative plantings at dune elevation on the Holly Beach dredge platform; 20,400 four-inch containers of bitter panicgrass (Panicum amarum) were planted. The installation of the plantings was completed in August 2003. Cameron Parish believes this project is what saved HWY 82 from being washed out during Hurricane Rita. This project is on Priority Project List 11. The project area is experiencing marsh deterioration due to subsidence, rapid tidal exchange, and human-induced hydrologic changes that result in increased salinities. Saltwater intrusion has caused a shift in marsh type and a conversion of over 30 percent of emergent vegetation to open water habitat. Shoreline erosion along the south embankment of Lake De Cade threatens to breach the hydrologic barrier between the lake and interior marshes. Proposed project components include installing three control structures along the south rim of the lake and enlarging Lapeyrouse Canal to allow the controlled diversion of Atchafalaya River water, nutrients, and sediments south into project area marshes. Outfall management structures are planned in the marsh interior to provide better distribution of river water. In addition, approximately 1.6 miles of foreshore rock dike is planned to protect the critical areas of the south lake shoreline from breaching. The project is located in Terrebonne Parish, approximately 15 miles southwest of Houma, Louisiana. After initial engineering investigation, the project was divided into two construction units. Construction unit one consisted of the shoreline protection only and was completed in July 2011. Construction unit two consisting of the freshwater introduction component was further investigated and due to uncertainty of benefits was not constructed, and therefore, the project is considered completed. This project is on Priority Project List 9. The Louisiana Coastal Master Plan strategically plans restoration and risk reduction projects for the current and future Louisiana coast. This state-wide plan is updated every 6-years and focuses on a 50-year view which “coordinates Louisiana’s local, state, and federal responses to land loss, and potential threats from hurricanes and storm surge events” . The Master Plan was developed by the Coastal Protection and Restoration Authority (CPRA) and models scientific data through different scenarios to determine which projects have priority. CPRA represents the State of Louisiana and contributes 15% of costs for Coastal Wetland Planning, Protection, and Restoration Act (CWPPRA) projects. Since all CWPPRA projects are partially funded by the state of Louisiana, then all CWPPRA projects must be consistent with the Coastal Master Plan. The Louisiana Coastal Master Plan is an example for communities around the world who are facing coastal land loss at home. For example there is a recent partnership agreement between the Dutch research institute Deltares and the Water Institute of the Gulf in Baton Rouge. Therefore both institutions can benefit and contribute to the planning being done to preserve Louisiana coastal wetlands. Other areas facing coastal land loss, like Singapore, Indonesia, and Canada also have an interest in the work being done in Louisiana and the Netherlands . By working together, communities in Louisiana and elsewhere can adapt to and protect changing coasts. Click here to learn more about Louisiana’s Coastal Master Plan. Click here to learn about your flood zone in Louisiana. Roberts, Faimon. Louisiana institute, Dutch research group launch partnership to study water issues. Available: https://www.theadvocate.com/baton_rouge/news/environment/article_35247102-635a-11e7-9176-9f60e4fab282.html [July 31, 2018]. The Louisiana Coastal Master Plan. Available:http://coastal.la.gov/wp-content/uploads/2017/04/2017-Coastal-Master-Plan_Web-Book_CFinal-with-Effective-Date-06092017.pdf [July 31, 2018]. This headland experiences some of the highest shoreline retreat rates in the nation, measuring over 100 feet a year in some locations. As the gulf encroaches upon the shoreline, sand is removed and the headland erodes. What was once a continuous shoreline spanning several miles has been reduced to less than half its original length. Furthermore, Hurricanes Katrina and Rita removed most of the emergent headland and dunes west of the pass. This headland helps provide protection to interior marshes and the Port Fourchon area; however, its continued degradation threatens the fragile bay habitat and infrastructure it once protected. This project will reestablish the West Belle headland by rebuilding a large portion of the beach, dune, and back barrier marsh that once existed. Approximately 9,800 feet of beach and dune will be rebuilt using nearly 2.8 million cubic yards of dredged sand, and 150 acres of marsh habitat will be rebuilt using nearly 1.4 million cubic yards of dredged material. Native vegetation will be planted upon construction to help stabilize the rebuilt marsh and dune habitat. 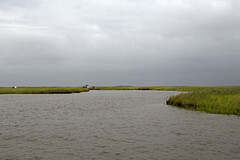 The project is located along the Chenier Caminada headland to the west of West Belle Pass, at the southeastern edge of Timbalier Bay in Lafourche Parish, Lousiana. This project was approved for engineering and design in October 2006. Construction funds were approved by the Task Force in late 2009, construction began fall 2011, and construction was completed in October 2012. This project is on Priority Project List 16. Neither time nor sediment should go to waste! CWPPRA and our partners believe that beneficial use of dredged material in projects is an important part of coastal wetlands restoration. Of course, some areas will not be in close enough proximity to a channel with reliable dredging, but we want to maximize beneficial use when and where possible. For CS-28-2, our partners installed a permanent dredged material pipeline to further decrease damage to coastal wetlands that temporary pipelines can cause. The permanent pipeline ensures that whenever the Calcasieu River Ship Channel needs dredging, the dredged material goes to restoring wetlands with as little detrimental influence as possible. Sediment is a valuable resource for coastal Louisiana, and the need for sediment across the coast means that we can’t afford to waste any. CWPPRA projects strive to use sediment from as many sources as possible so that more projects have the material they need- with some creativity, a little sediment can go a long way.